At least 11 people including children drowned when an amphibious "duck boat" carrying 31 people capsized and sank in stormy weather on a lake in Missouri on Thursday. 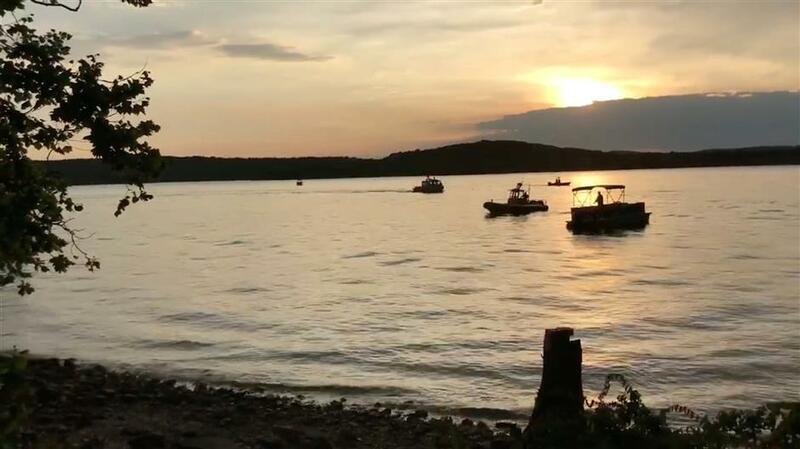 Rescue personnel work after an amphibious "duck boat" capsized and sank, at Table Rock Lake near Branson, Stone County, Missouri, US on July 19, 2018, in this still image obtained from a video on social media. Divers will resume searching for other victims on Friday, police said. Seven people were taken to hospital following the incident on the "Ride the Ducks" amphibious vehicle on Table Rock Lake, near Branson, Missouri, Stone County Sheriff Doug Rader told reporters. At least 11 people were killed in the incident as divers finished their search effort on Thursday night. They will resume searching early Friday for about five people still missing, the sheriff said later in a news conference. Emergency crews responded to the incident shortly after 7pm (0000 GMT) after thunderstorms rolled through the area, the fire district said on Twitter. "There was some heavy wind. It was having problems through the wind," Rader told reporters. "They were coming back toward land. There was actually two ducks. The first one made it out. The second one didn't." Seven victims including two critically injured were treated at the Cox Medical Center in Branson, the hospital said on Twitter. "Our number one priority is the families and our employees that were affected by this tragic accident; as of this time right now we are assisting the authorities as they continue with their search and rescue operation," said Suzanne Smagala-Potts a spokeswoman for Ripley Entertainment, which owns the Ride The Ducks operation in Branson. The company that builds ducks, Ride the Ducks International LLC, agreed in 2016 to pay a US$1 million fine after one of the vehicles collided with a bus in Seattle, killing five international students.